On 17th November 1914, an article appeared in the “Science and Nature” section of The Scotsman, entitled “Sphagnum Moss in Surgery”. The article, written by an Edinburgh military surgeon, Charles Walker Cathcart and Regius Keeper of the Royal Botanic Garden, Edinburgh, Professor Isaac Bailey Balfour told of the extraordinary capacity of Sphagnum Moss to absorb and retain water. They identified two particular species of Sphagnum Moss that grew in abundance in Scotland, Ireland and parts of England which were particularly superior at absorbing blood, pus and other body fluids. Very importantly, Sphagnum Moss has antiseptic properties. Although the wound-healing properties of Sphagnum Moss had been known for centuries, the Germans had recognised its significance in surgery from the early 1880s. By the outbreak of hostilities in 1914, Sphagnum Moss was well established as the standard material for surgical dressings in Germany. British surgeons on the other hand used cotton wool dressings at this time which were less than half as absorptive as Sphagnum moss and less comfortable a dressing for patients. The imported cotton was also more expensive, and as the war progressed, more and more of it was being commandeered by the military to make notrocellulose explosive. Cathcart and Balfour advocated the use of Sphagnum moss and centres for its cleaning and preparation throughout Scotland. His model soon spread to the rest of the UK and Ireland. 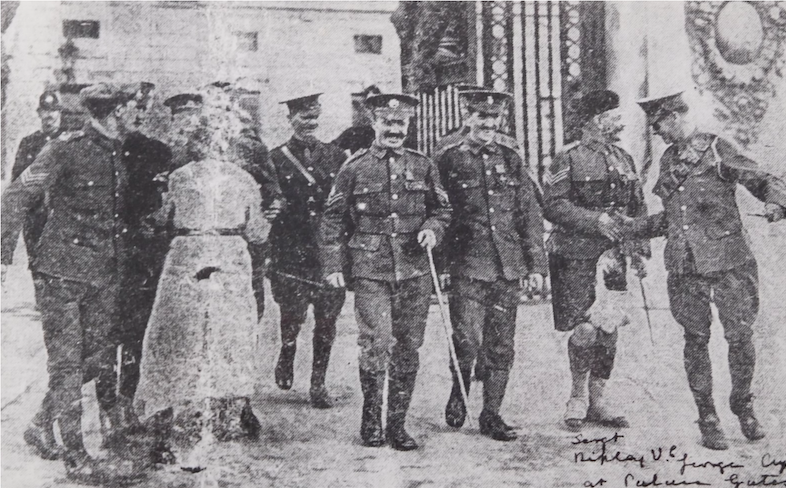 By June 1916, The Scotsman reported that Cathcart’s “Edinburgh Infirmary War Dressings Supply (Sphagnum moss)” organisation was sending out about 20,000 of these dressings per month to hospitals. 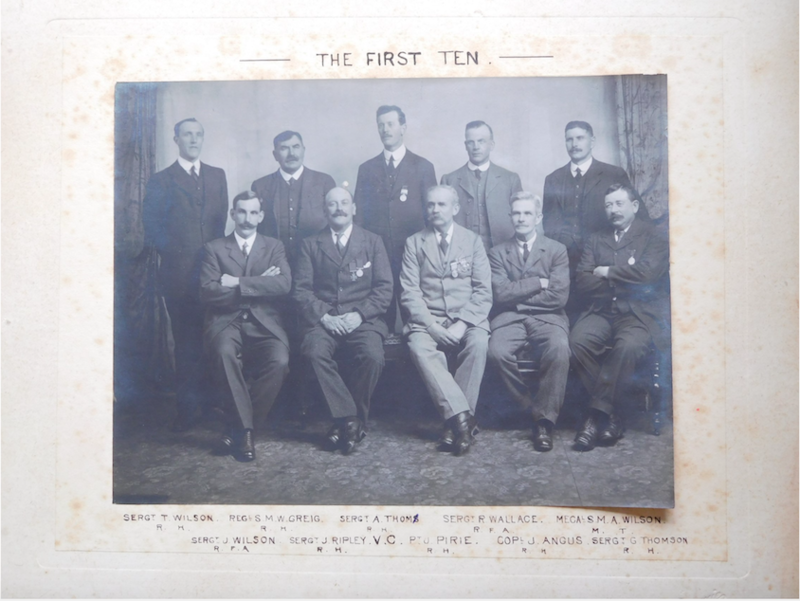 Although appeals went out through The St Andrews Citizen for townsfolk – and holidaymakers – to help collect Sphagnum moss, it was the St Andrews Boy Scouts who were the major collectors. It grew on the moors of Stavithie and Cassindonald Farm near Mount Melville. The moss was delivered to households by the Boy Scouts to be dried. The semi-dried moss was then passed to a large body of volunteer cleaners or “pickers”. In June 1916 it was reported there were nearly 100 volunteers pickers. While the collection of moss fell largely to the Boy Scouts, the cleaning was predominantly the responsibility of the League of Honour Girls Club (formed from the National Union of Women Workers in 1915) at 8 Playfair Terrace. The occupants of Gibson’s Hospital were also employed as pickers. The St Andrews War Hospital Supply Depot was initiated in 1915 by Mrs Gilbert Watson, End House. This was a sub-group of the Queen Mary’s Needlework Guild whose war-time focus was on making articles of clothing for the sick, wounded and prisoners of war. The Depot was to become one of Charles Cathcart’s Centres for preparing Sphagnum moss surgical dressings, overseen by the Edinburgh Infirmary War Dressings Supply (Sphagnum moss). 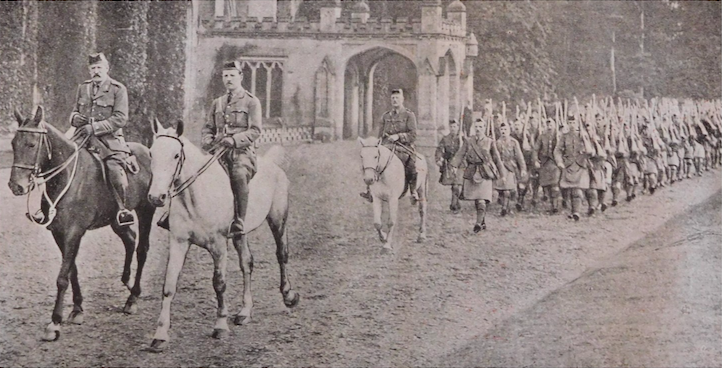 It was noted in March 1918 that St Andrews had been commended as one of their most important branches. 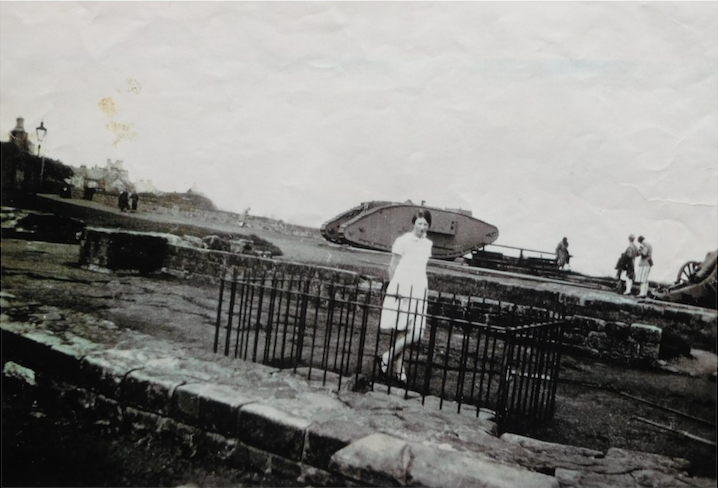 The War Hospital Supply Depot, operated initially from Mrs Watson’s home but soon that became impractical. The situation was resolved by the University when they put Upper College Hall at the Depot’s disposal. There was also a branch of the Depot at St Leonard’s School where the girls made some 60,000 Sphagnum dressings and swabs. In the first year, the Depot sent out a total of 76,785 articles with 132,141 in the second year. This reflects the ever increasing demand for hospital supplies as the war progressed. “Gathering the moss was a troop effort. The moss was collected from wet/boggy areas – I believe from some miles up the Grange Road. A motor car was used to carry the youngest Scouts to the area, and returned to pick up subsequent groups. 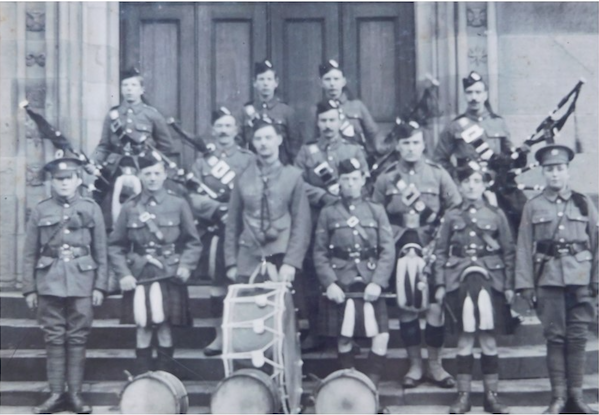 The Highland Cyclist Battalion was formed from the 5th Volunteer Battalion of the Black Watch and came into being on 2nd July 1908. 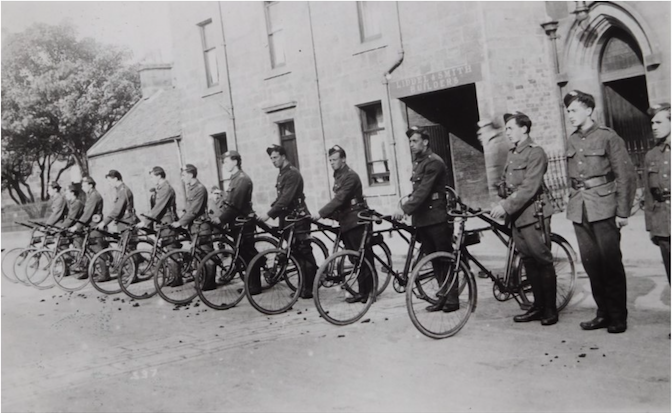 Its function was coastal defence, but its members also undertook messenger services as the danger of invasion along the Fife and Angus coast was fairly limited. The battalion was to a limited extent motorised with both vehicles and motorbikes. 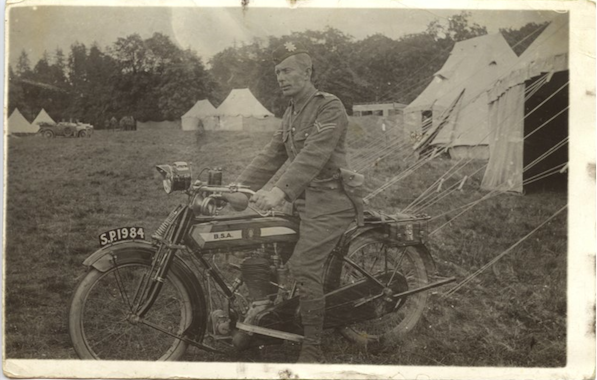 Corporal John Christie, a member of the Highland Cyclist Battalion, on his motorbike at a Fife camp, prior to mobilisation. 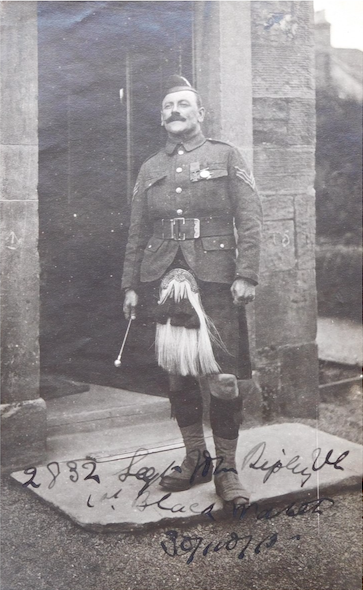 Corporal Christie was one of the few motor cycle dispatch riders. Later in the war he became a sergeant instructor, armours. Photography courtesy of the St Andrews Preservation Trust.